Wait, young Douglas’s grandfather says as the bobber twitches on the surface of Little Lake. Be patient. And so begins an encounter with the promise and wonder of nature that will last a lifetime. 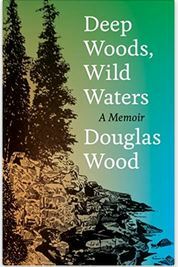 Deep Woods, Wild Waters traces the winding path that carried Douglas Wood from one wonder to the next, through a landscape of rocks, woods, and waters, with stops along the way for questions and reflections that link human nature to the larger mysteries of the natural world. Like life itself, the author’s way is not linear. One landmark leads back to a favorite campsite, another prompts him to consider the “gospel of rocks,” another launches him into the wilderness beyond the stars—a contemplation of time and space and humanity’s place in all of it. The creator of thirty-four books, including the classic Old Turtle, and an expert woodsman and wilderness canoe guide, Wood brings all his storytelling and bushwhacking skills to bear as he takes us hurtling down wild rapids, crossing stormy lakes, or simply navigating the treacherous currents and twisty trails of everyday life.